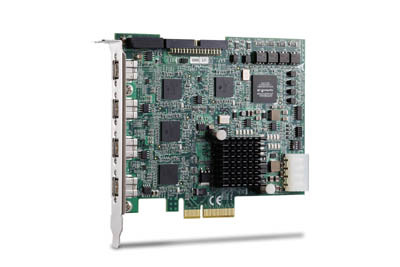 The PCIe-FIW64 is IEEE 1394b (FireWire 800) interface card designed for high speed computer-based machine vision applications. 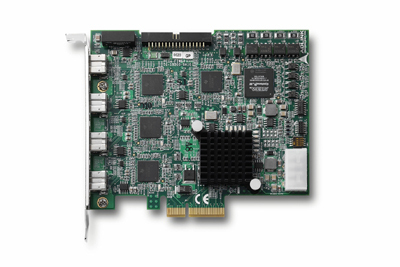 The PCIe-FIW64 support up to four 1394b (FireWire 800) ports for multiple 1394b device connections with data transfer rates up to 3.2 Gb/s, as found with most IEEE 1394b cameras. 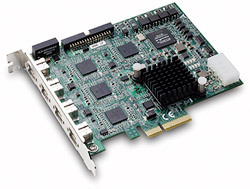 The PCIe-FIW64 provides four direct-connect IEEE 1394b connectors with a screw-lock mechanism. These screw-lock connectors provide a reliable connection between PCIe-FIW64 and up to four IEEE 1394b cameras. A 4-pin ATX power connector on the PCIe-FIW64 support IEEE 1394b cameras that draw power directly from the frame grabbers. Each port has a green LED on the front panel that will illuminate when the PCIe-FIW64 is connected to a IEEE 1394b camera for convenient identification of channel connection status. The PCIe-FIW64 provides four isolated digital inputs and outputs to connect to external devices such a position sensor. The PCIe-FIW64 also includes four isolated programmable trigger output pulses to manage trigger events such as activating a strobe light.